A delight for the eyes and the taste buds, our Evergreen tin is filled with food to Celebrate the Season and the closing year. Trees are embossed on the tin, and we continue this with a Gingerbread Tree right in fron. 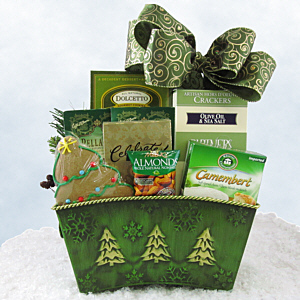 Nestled beside it are Almonds, Camembert Cheese, Olive Oil and Sea Salt Crackers, Docletto Tiramisu Cookies, Bellagio Holiday Mocha and Seattle Truffles that proclaim Celebrate.